Beamsplitters are used to reflect a certain percentage of incident energy, while transmitting the remaining energy. In most cases, beamsplitters are angle, wavelength, and polarization sensitive. 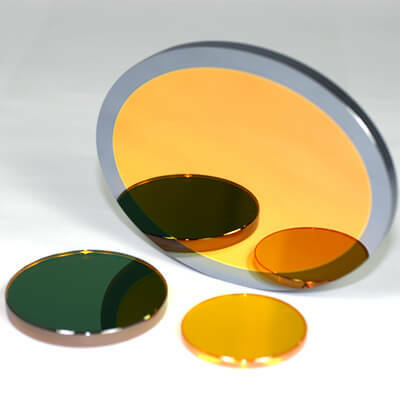 Most beamsplitter coatings are highly polarization sensitive. Thus, if the source’s polarization state varies with time, as in some randomly polarized lasers, the beamsplitters transmission will also vary with time. Our standard beamsplitter is supplied with a wedge of 6 to 10 arc minutes. This wedge amount significantly reduces interference caused by reflections off the second surface, which can cause an etalon effect and disturb optical performance. All II-VI beamsplitters are E-field optimized to minimize absorption and increase their damage threshold. Because of the virtually limitless number of nominal reflectivity and polarization states for beamsplitters, II-VI does not maintain a standard beamsplitter stock. Thus, when manufacturing a beamsplitter, a special coating run will be performed to meet the precise specifications you require. A coating lot charge is incurred to provide this service. However, under some circumstances, it’s possible to use our standard partial reflector coatings designed for 0° incidence as a 45° angle of incidence beamsplitter. When this is done, remember that neither the beamsplitter nor the second surface anti-reflection coating is designed for use at 45°. For this reason, it’s not possible to put a standard tolerance on these parts. Fortunately, because these are standard coatings, they cost significantly less than having a special beamsplitter fabricated, so that their price advantage may outweigh their performance disadvantage. With beamsplitters operated at 45°, it’s necessary for the substrate to have a slight wedge amount in order to eliminate interference effects. When purchasing a standard 0° angle of incidence partial reflector for use at 45°, it is essential that a substrate wedge angle of 6 to 10 arc minutes be specified at the time for ordering. Furthermore, we will laser test your part for reflectivity at s and p polarization free of charge if you request it at the time of order.